Tá súil againn go mbíonn deis agaibh labhairt i nGaeilge sa bhaile ó am go ham. Bain triail as na frásaí agus na focail thíos a úsáid le do pháiste nó do pháistí sa bhaile. 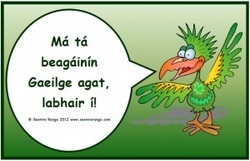 We hope you get a chance to speak in Irish at home from time to time. Why not try using the phrases below when speaking with your child/children at home. Is féidir leat spraoi nuair atá an obair bhaile críochnaithe. (You can play when the homework is finished). Cá bhfuil do dhialann/do mhála scoile/do chóta/do bhosca lóin/do dheoch/do chóipleabhar/do pheann luaidhe/do leabhar? Where is your diary/your school bag/your coat/your lunch box/your drink/your copy/your pencil/your book? Téigh amach ag spraoi (Go out to play). Fanaigí le chéile (stay together). Bí cúramach ar an mbóthar (be careful on the road). Cur ort do chóta (put your coat on). Tá an lá go hálainn (it’s a lovely day). Tá sé grianmhar (sunny), scamallach (cloudy), gaofar (windy), fuar (cold). Tá cuma báistí air (It looks like rain). Put on your school uniform. Léine (shirt), T-léine (t-shirt), blús (blouse), carbhat (tie), gúna (dress), bróga (shoes), buataisí (boots), casóg/seaicéad (jacket). Cé mhéad deartháir/deirfiúr atá agat?